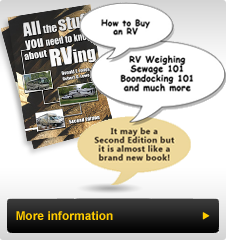 As we embarked on this Alberta, British Columbia, Yukon and Alaska RV trip, we wondered if a flight would be part of the adventure. I thought it would be fun and an interesting way to learn about Alaska and perhaps provide the opportunity to see Denali (Mt. McKinley) close up. Jane was concerned that the panic of travelling in a small plane would greatly reduce both her and my enjoyment of the flight. We agreed I’d go and she would provide "ground support”. 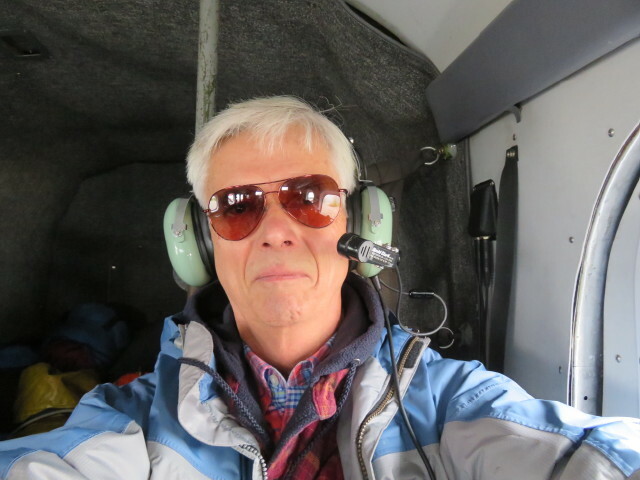 On Thursday, July 16th at 8:30AM, we arrived at the Talkeetna, Alaska Airport and I put on my glacier boots, (over running shoes) had my jacket and a warm coat, camera and the requisite sunglasses. 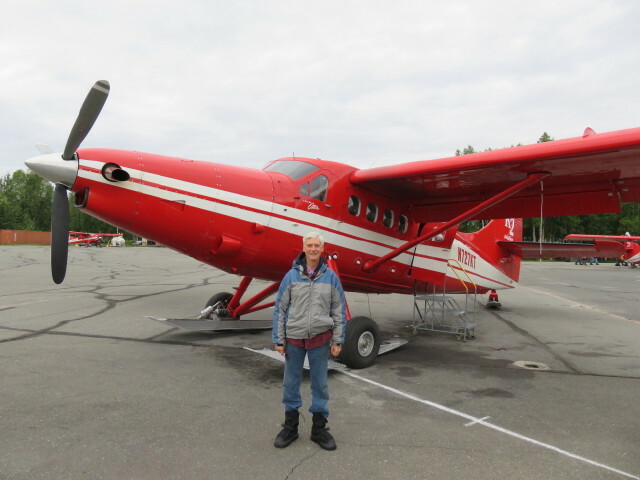 Those of us flying on K2 Airways walked out with our pilot who introduced us to the bright red De Havilland Otter aircraft we would be flying on. This plane was built within 6 miles of my childhood home back in the early 1960’s. 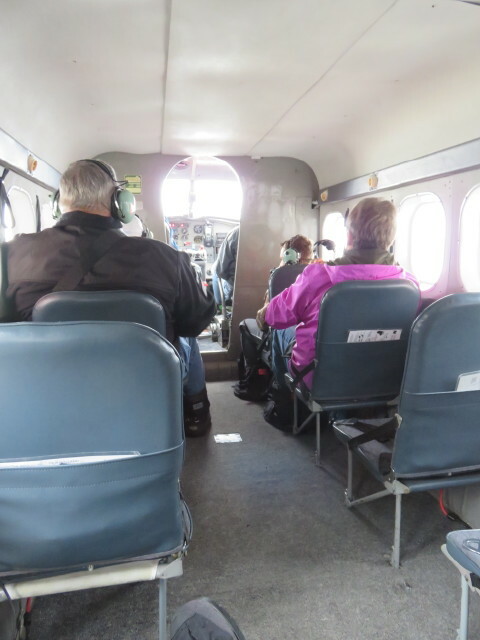 The praise that Mike, our pilot, heaped upon this aircraft was pretty amazing. 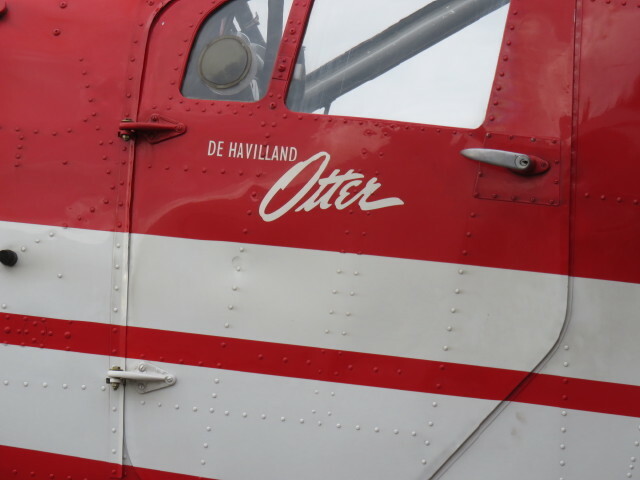 According to him, the pilots love these Otters. After the requisite photos (not my Sunday best)J and the mandated FAA pre-flight safety spiel, we boarded and donned our headsets, which allowed us to not only communicate with the pilot and other passengers, but also to hear the radio traffic between other aircraft and our pilot, the tower and all the info that transpires between the plane and other communication services. You quickly sense that your flight will be a "unique” experience since by sharing the info, the pilot can (and did) make changes to the flight plan. I was fortunate to have the Emergency Exit position with extensive legroom. The passengers consisted of a couple from Idaho, a grandfather, son and grandson from the southwest and me. 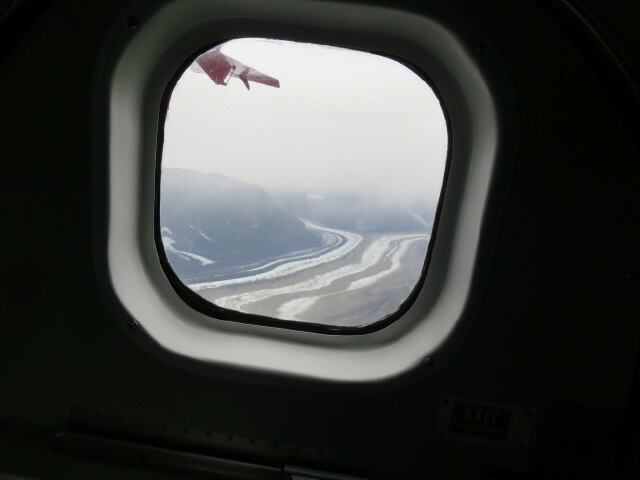 The man from Idaho took the co-pilot position on the outbound portion and I was pleased to take it on the return leg. 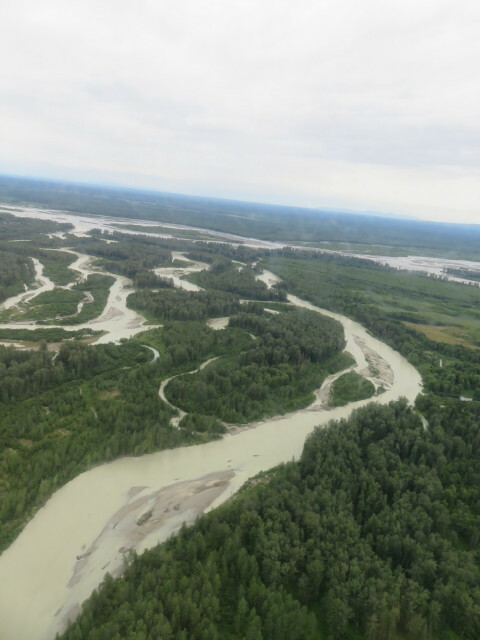 Shortly after takeoff we crossed the Susitina River as it joins the Talkeetna River, both of which are a green-grey silty colour, evidence that they are glacier fed rivers. 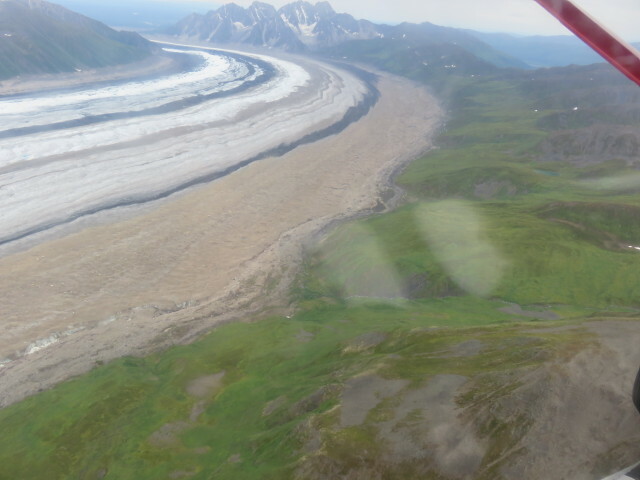 As we peered down at the glaciers, I was struck by how little I knew about glaciers. I always thought they were white slabs of ice and snow. 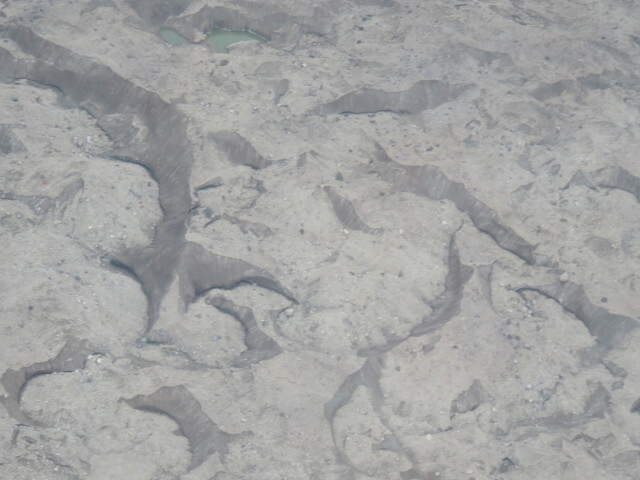 Actually they are more likely to be grey and various shades of brown and black from the silt they produce as they grind away at the mountain sides while making their way down the valleys between the mountains. 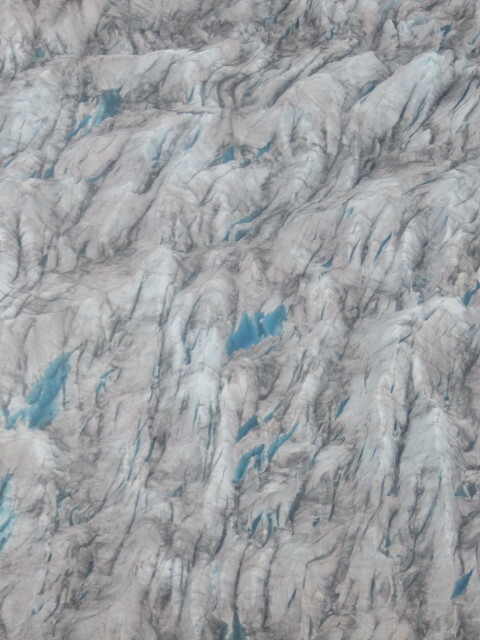 The patterns in the glacier create interesting 3 dimensional shapes and various green or blue melt water lakes that contrast against the glacier. 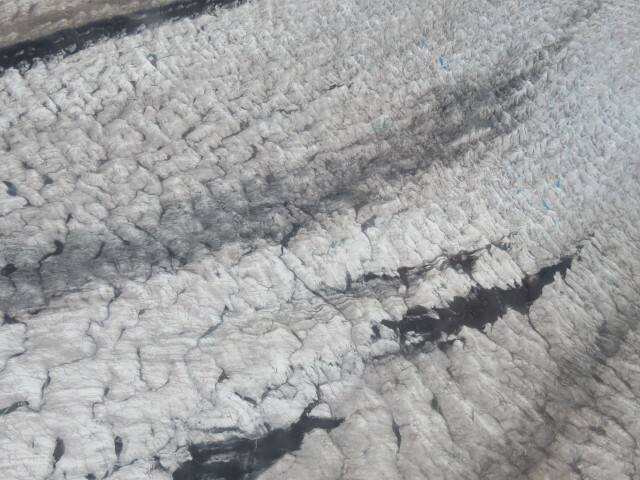 The dark ridge down the center of the glacier (shown in #7) is created by the merging of two glaciers which look like one freeway joining another (slide 12). 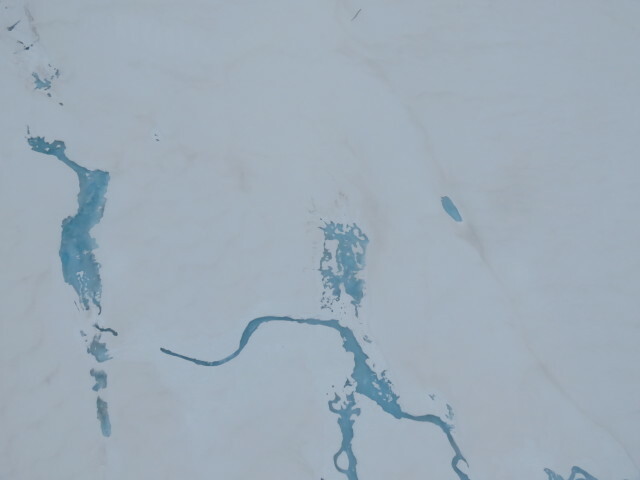 Look at the textures and different shapes formed by the meltwater settling into the depressions in the ice. Can you see the bearded man in slide 10? 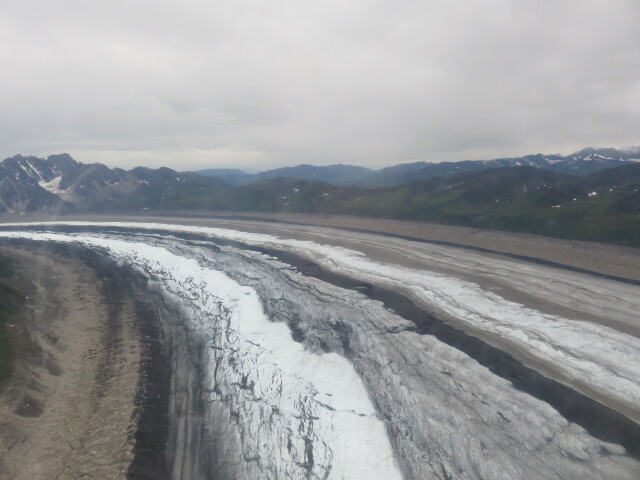 As slide 11 shows, the glacier can have vegetation growth on the mountain slopes right up to it. The view through the window via a camera is somewhat different than what the eyes sees. I can say that order and plan of the universe of God’s creation is very evident in the majesty of the views. More in the next set of photos.